JRP is highly concerned on environmental sustainability and effort is made to improve the energy efficiency and introduce green features. Our EMS is an integrated part of QMS, all person working for or on behalf of the JRP are committed to protect and enhance the environment in a sustainable way. 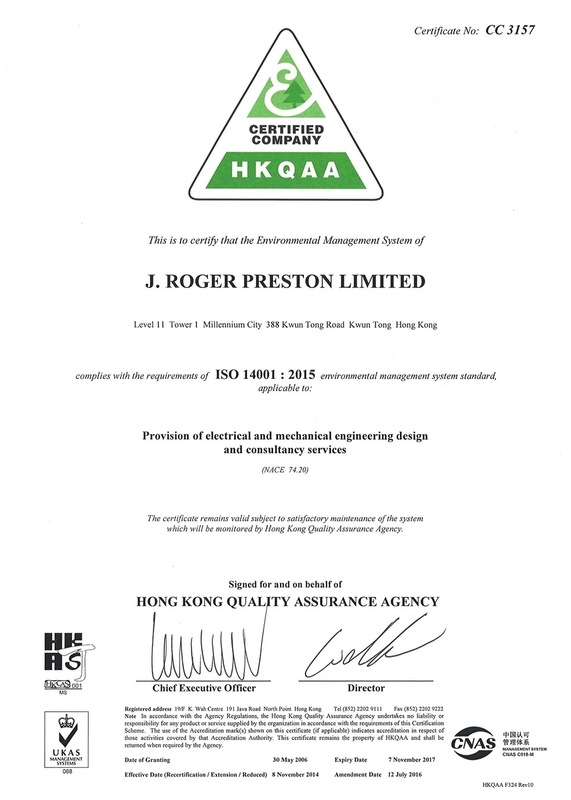 In 2006, JRP has been certified to ISO 14001 and converted to ISO 14001:2015 in 2016. JRP is committed to protect and enhance the environment in a sustainable way by preventing pollution, reducing waste, producing environmental friendly design and improving the environment performance continually. All activities carried out by JRP shall comply with regard statutory, regulatory and legal requirements as well as the other requirements that the company subscribes which relate to its environment aspects. Also JRP promotes the risk-based thinking and address the risks and opportunities that can affect the conformity of the service in environmental aspect. Copyright © J. Roger Preston Limited.